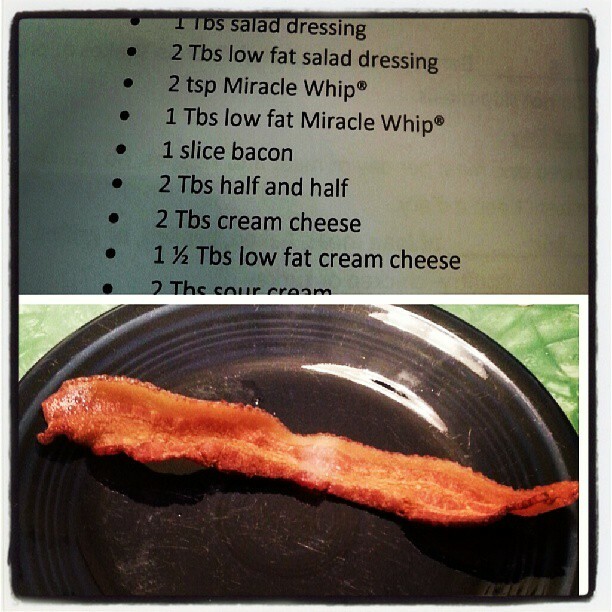 Can you believe that bacon is allowed as a fat choice on my pre-op diet? Me either! Today marks Day 3 of my pre-op diet, and I have to say, it’s actually going better than I ever expected. I have been stomach-growling hungry only twice so far, and had a wicked headache yesterday. I think that was partially due to the fact that I didn’t eat breakfast–I couldn’t, because I had an upper GI series scheduled for yesterday morning–and carb withdrawal. While my surgeon’s plan allows me to consume 1200 calories and 120 grams of carbohydrate, I’m trying to keep my carbs below 100 grams. I wasn’t given a specific protein goal to hit, but I’m trying to get between 80 and 100 grams of protein daily as this is my post-op goal. I have also managed to keep my fat grams below 40 each day. And of course, I’m drinking water like crazy. So far, the result has been that I’m down 9 pounds (!) and my shorts are fitting a bit more loosely (I need a belt!). Of course, this is only Day 3 of 19. Ask me how things are going at this time next week! All clear high protein, low carb liquids just a few days prior to surgery. All high protein, low carb shakes for 2 weeks prior to surgery. 2 high protein, low carb shakes and a Lean Cuisine for a few days prior to surgery. No pre-op diet at all. The variance in plans is wide, but all but the last plan have one thing in common: they are all attempting to shrink the patient’s liver. Now why would you want to do that? you ask. Well, I’ll tell you. The liver is a fantastical organ, performing dozens of tasks such as making bile, detoxifying drugs we take and producing cholesterol, amino acids and some sugars. 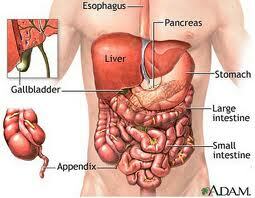 The liver also acts as a storage organ for the long-chain carbohydrate glycogen, which is how animals store starch. When you consume carbohydrates, particularly starchy carbs, whatever is left unused by your cells is converted into glycogen. If this glycogen is not used within 72 hours, it is then converted into fat stored in your adipose tissues. Your body figures, well hey, if we’re not going to use it now, we might as well hang on to it. See how the left lobe of the liver covers up the top of the stomach? If the liver is slippery, it makes grabbing a hold of it to pull it back tough on the surgeon, and thus makes the procedure that much more difficult. Some surgeons will even halt the surgery if the liver doesn’t look good to them. Enter the “liver reduction diet.” A diet low in carbohydrates (particularly sugars) and fats and high in protein is designed to force the body to use the liver’s glycogen stores, making the liver less slippery and easier to handle during surgery. **DISCLAIMER: I am not a nutrition or medical professional, but a biology teacher so my explanations of the above processes are from a biologist’s point of view, not a nutritionist’s or physician’s. I am hoping that by being on this diet, my liver will be sufficiently shrunken to my surgeon’s satisfaction so that my surgery can proceed. I’ve got 16 more days of this, and then it’s showtime. In other news, my pre-op appointment was scheduled today, so I go into the hospital on July 3 to get paperwork signed and all that stuff. I’m going to be meeting with an attorney soon to get my living will taken care of so that I have that in hand the day of surgery. I am having a tough time believing that this is all real, and that it is actually going to happen. In less than 3 weeks. This entry was posted in pre-op, vsg, weight loss surgery and tagged biology is awesome, eating, liver reduction diet, nutrition, obesityhelp.com, pre-op, pre-op dieting, progress report, sleeve gastrectomy, VSG, WLS. Bookmark the permalink.